Udupi, July 27, 2016:Reports are that the state government has affected mini round of transfers of district level policing unit heads. K T Balakrishna, a 2006 batch IPS officer to replace K Annamalai as superintendent of police, Udupi district. Balakrishna is currently SP, Gadag. 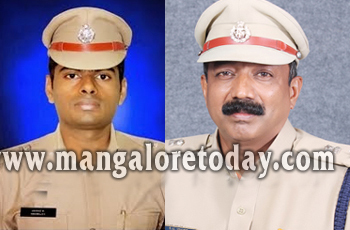 -K Annamalai from Udupi goes to Chikkamagaluru as district police chief there, it has sent the incumbent K Santosh Babu there to replace Balakrishna. Both Santosh and Annamalai are 2011 batch IPS officers. The SP Annamalai, told media that he would be taking charge in Chikkamagaluru by this weekend. He said he had a wonderful experience in the district as he has also served as the probationary officer in Karkala sub-division. He said it was all a learning experience and the district gave him all necessary experience to fulfill his dream as a police officer. Annamalai said Udupi would always remain special to him as he started his career in the district. Incidentally, the current posting for Annamalai to Chikkamagaluru means he has served his formative years in the Indian Police Service in Western Range of Karnataka State Police. Udupi, Dakshina Kannada, Uttara Kannada and Chikkamagaluru form part of Western Range, and Annamalai was assistant superintendent of police in Karkala sub-division of Udupi district police before assuming the mantle of district police chief in the very same district.